Background: Controversy still presents regarding the ideal proximal extension of lymphadenectomy at radical cystectomy. Objective: To provide an accurate map of lymph node metastasis in patients with bladder cancer and to evaluate benefit and morbidity of extended lymphadenectomy. 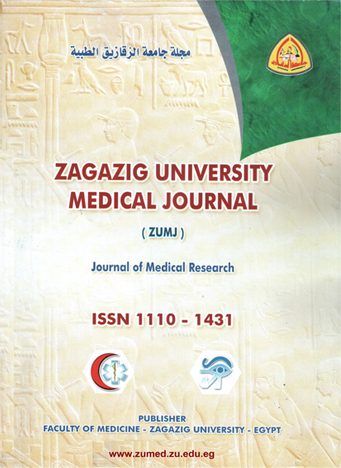 Patient and method: A Prospective study of 65 patients with bladder transitional cell carcinoma with stage T2-T4a-Nx-M0 undergoing radical cystectomy with mapping extended lymphadenectomy was completed between September 2011 and March 2015 at the Department of Urology, Zagazig University Hospitals. Intervention: Radical cystectomy with mapping extended lymphadenectomy. Results: The mean ± SD total of retrieved lymph node number in the study population was 28.7±9.8. Twenty of 65 patients (30.7%) had positive LN. LN metastases above bifurcation of common iliac artery are common (40 % of patients with positive lymph node had metastasis in common iliac lymph nodes and presacral lymph nodes). No skip metastasis to above common iliac bifurcation LN. Negative LN patients had better survival than positive LN patients and survival did not affected by location, number and density of positive LN. Conclusions: Extended lymphadenectomy till level of bifurcation of aorta provide better identification of positive lymph node correctly and good assign of pathological node metastasis stage in node positive cases without significant morbidity.